The Egyptian language is a member of the Afro-Asiatic family of languages and is related to Berber and Semitic. 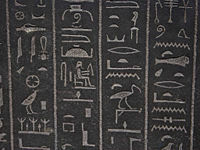 Egyptian is one of the oldest recorded languages with examples dating as far back as 3400 B.C. It survives today as Coptic, the liturgical language of the Coptic Church, but has otherwise been extinct since the 17th century. The development of Egyptian is broken into six stages. Middle Egyptian fell out of everyday use after 1300BC, but survived through the first few centuries AD as a formal written language until the Roman Period, used in classical literature, scribal training and religious texts. The structure of Egyptian is similar to many other Afro-Asiatic languages. Most words have a root of three consonants, although some have more or less. Vowels are only written in the Coptic script. All written forms of Egyptian only record the consonental skeleton of the word. Egyptian, like many of its related languages, has single, dual, and plural forms of nouns, meaning a noun can be written three different ways signifying one thing, two things, and three or more things. Like the Romance languages and Irish Gaelic, Egyptian nouns are either masculine or feminine. Egyptian’s basic word order is VSO (verb, subject, object). ‘The man opens the door’ would be ‘Opens the man the door’. The Egyptian language was one of the earliest written languages, along with Sumerian, with the earliest occurrences on the Narmer Palette and Scorpion mace-head dating back prior to 3000BC, with many more examples known from the Early Dynastic Period (3000 - 2800BC). The Egyptian language is famous for the beautiful and distinctive hieroglyphs often used to write it. Hieroglyphs were used from the Late predynastic/Early Dynastic periods through to the Greco-Roman period. Hieroglyphs record the sound of the word, and are not pictographic, as was once believed, though many words include a graphic "determinative" to distinguish words that can be spelt the same, as well as to aid the reader. Hieratic is a cursive form of the hieroglyphic sign set, and was mainly used for writing on papyrus, whereas hieroglyphs were preferred for solid surfaces such as stone, wood and ivory, as well as in stamps and seals. In Egyptology, hieratic papyri are often transliterated into hieroglyphs for publication alongside the transliterated and translated text. It is not an independent alphabet, rather is the equivalent of joined up handwriting compared to block capitals in the Latin script. It retains and uses the determinatives of the hieroglyphic system. Hieratic first appeared in the Old Kingdom. With the growth of Christianity in Roman era Egypt, the Greek alphabet was adopted a base for a new script for writing religious documents that would be "untainted" by the "heathen" Pharaonic writing systems. Due to the Greek alphabet not being able to record all the sounds of Egyptian, several Demotic signs were added to the script, creating the Coptic script that remains in use today in Coptic theological texts. In addition to the text, many Greek words were also incorporated into the language, and this remains the case today. Coptic is the only form of Egyptian where details of distinct dialects are known, though today Bohairic Coptic is the only form that survives, and is the focus of attempts to keep the language alive in its spoken form. Earlier forms of Egyptian certainly had dialects, as reference is made to them in surviving texts. However, as written Egyptian was standardised, we have no knowledge of their nature. This page was last modified on 18 July 2016, at 08:23. This page has been accessed 9,786 times.